Romeo and Juliet. Cleopatra and Marc Antony. Guy and Pip. Taylor Swift and Joe Jonas/Tayor Lautner/John Mayer/Jake Gyllenhaal/Harry Styles. The Pickiest Eater and The World and Pork. Some of the greatest love affairs that the world has ever seen. I love pork. LOVE. I love pork more than Kanye West loves Kanye West. Which is why whenever a restaurant that specializes in Pork dishes pops up, it is immediately on my radar. From the moment I heard about the recently opened restaurant called "Livestock", I kept bugging Rina about making time to visit. Finally the day came in which I could no longer deny myself of the delights of this Porky Paradise. And what I discovered was a close to carnivore's "Heaven on Earth" as you can get! 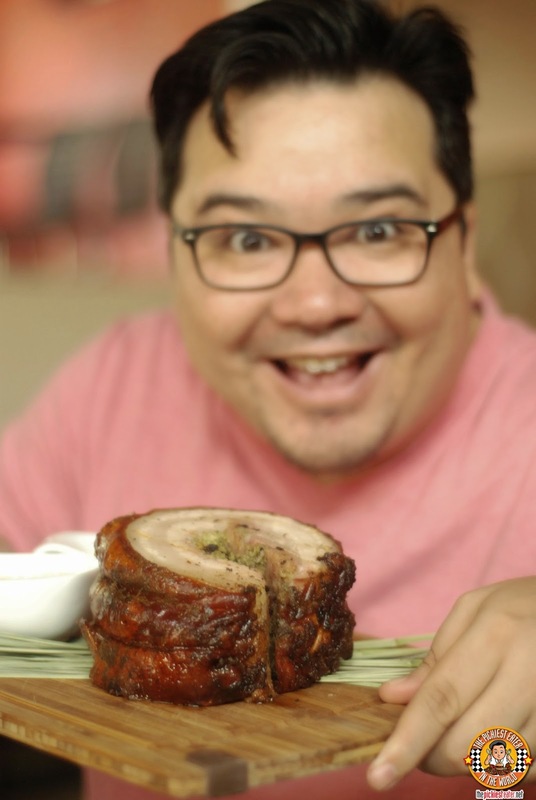 Livestock Restaurant and Bar is the brainchild of Mic and Ching Uy, a married couple that happens to be phenomenal chefs, especially when it comes to pork (My adoption papers are currently being processed). The name, "Livestock" is derived from the fact that their family actually owns a piggery, giving them easy access to a supply of pork. Livestock occupies a huge structure within the Jardin De Zanaida Compound along Sergeant Esguerra Avenue in Quezon City. 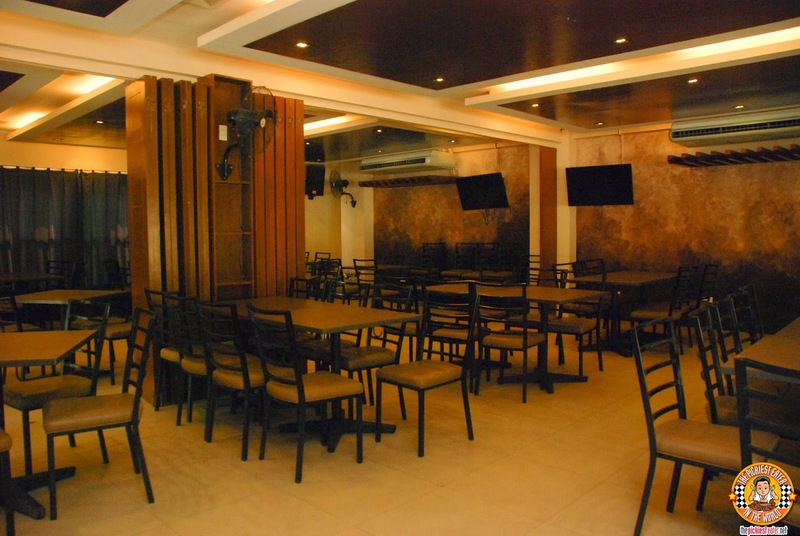 The interiors have soothing rustic touches, giving the place a nice, homey feel. The dining area is spacious, but make no mistake about it.. This place can get filled up during peak hours! You'll find a huge conference room on the second floor, that can fit up to 80 ppl, or divided into two rooms, fitting 40 people each. Perfect for meetings, parties and the like! 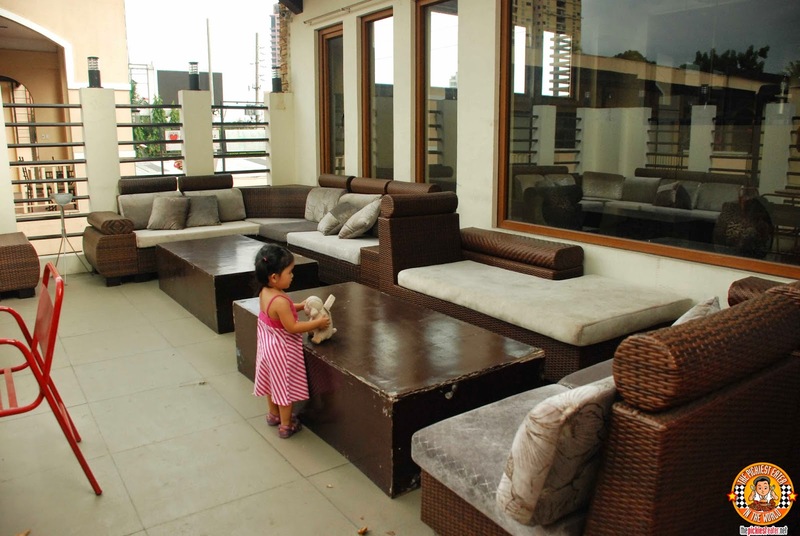 Comfortable couches are placed on the rooftop, creating an Al Fresco area. The light breeze and smoking area accessibility makes this a favorite spot for customers in the evening. I was all hyped up for my meal and was expected to be surrounded by a plethora of pork dishes, then the waiter plops this plate of greens in front of me. Without saying a single word to me, Rina couldn't help but chuckle as she said my facial expression was a dead giveaway of my disappointment. What do you expect? I was expecting some fatty pork dishes, and they place a Caesar Salad in front of me! However, there was something I didn't take into consideration. 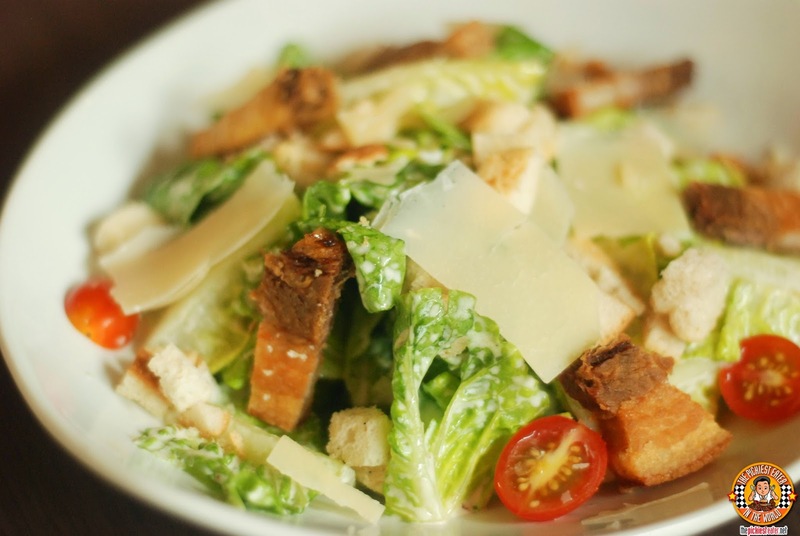 This was not your run of the mill, Caesar Salad. 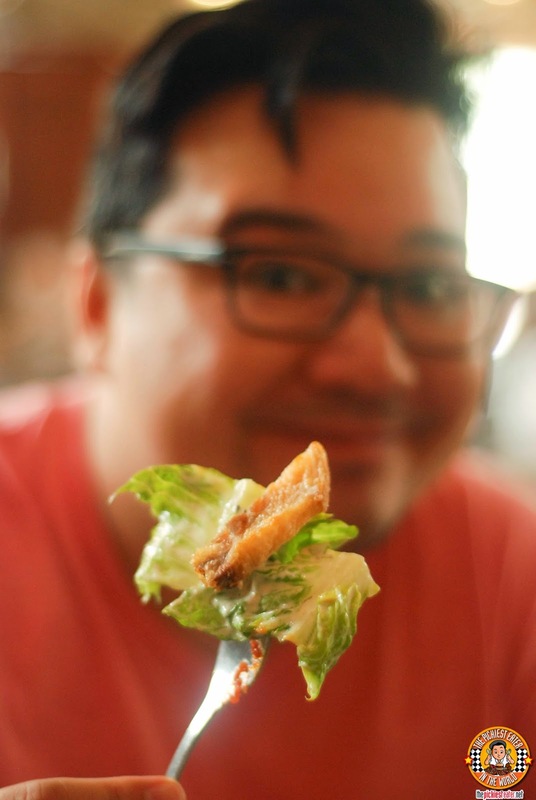 This was the Livestock Caesar Salad (P230). A closer inspection of the salad saw that it was given the Livestock treatment. The fresh Romaine Lettuce was tossed in a creamy Caesar dressing, before being topped, nay, blessed with crispy bits of pork belly. Shavings of sharp cheese round out the dish. As you can imagine, this is one of the very rare salads that I wouldn't mind ordering (Although I'm not sure how much more I could eat if the pork and cheese are gone hehe). Truthfully, I wouldn't go to a restaurant like Livestock and order seafood dishes. I would prefer to save my stomach space for the more carnivorous dishes. However, Livestock's Seafood menu gave Chef Ching and Chef Mic a chance to show how diverse their culinary skills are, and prove that they aren't one trick ponies that only know whip up fantastic pork dishes. 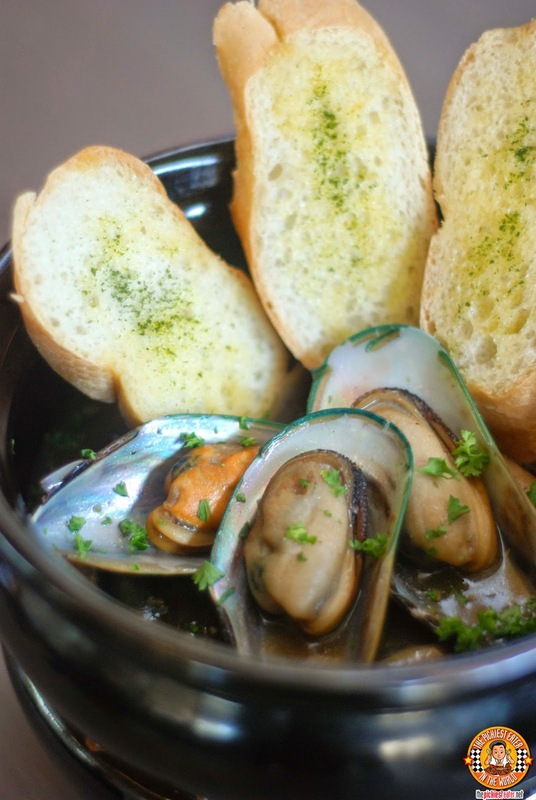 People who want to go easy on the pork dishes can have the The Drunken Mussels (P330). Fresh New Zealand Mussels mixed with herbs for added fragrance, and of course shredded pork bits, to keep true to the Livestock name. 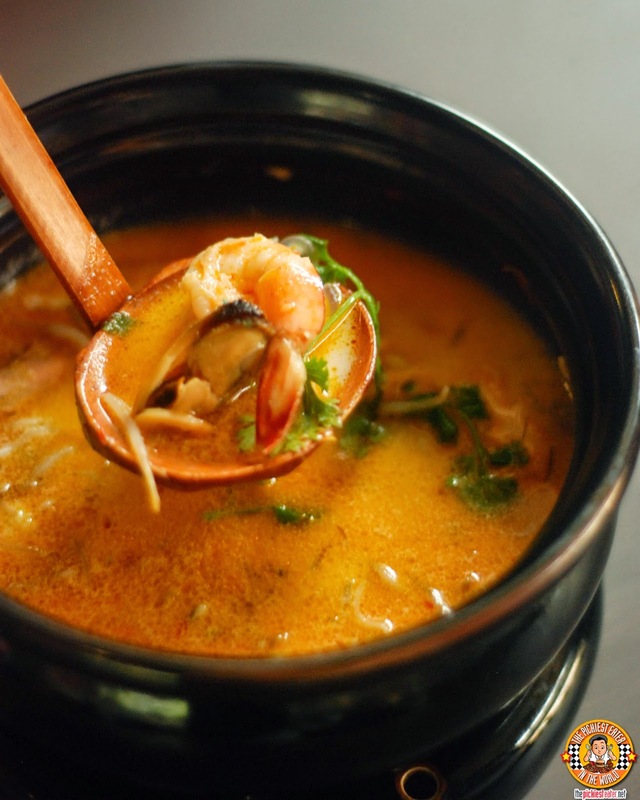 You may also choose to try the Seafood Laksa Soup (P290), which is a medley of fresh catch from the sea, swimming in a spicy broth, bursting with flavor, that offers a gentle sourness. My personal choice among the seafood favorite among the seafood dishes was the Mushroom Duxelle Fish Fillet (P290). 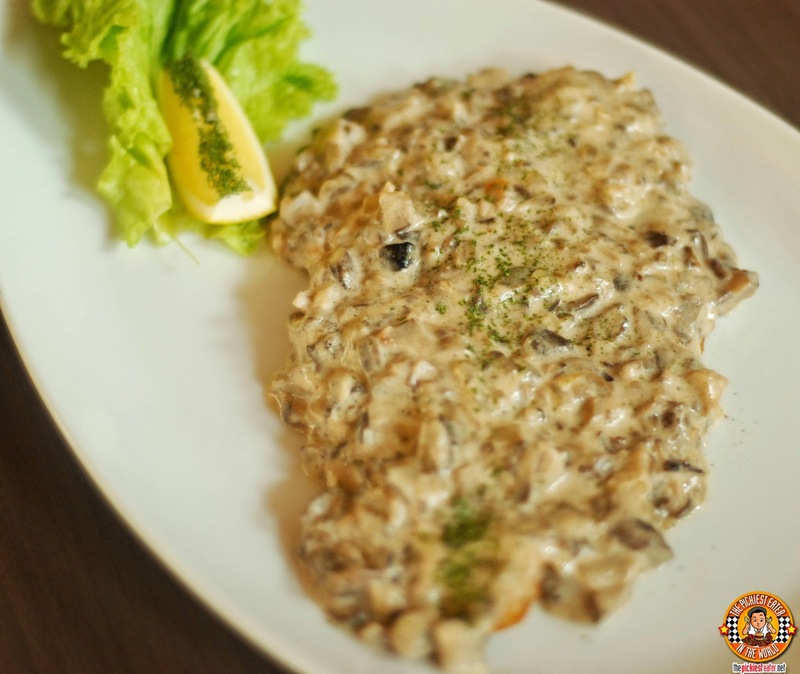 A soft Cream Dory fillet, smothered in a lemon butter caper sauce, topped with finely minced mushrooms. While the salad and seafood were cute and all, that's not what drew me to Livestock. It was time to get down to business and check out their meat dishes that has the metro all in a frenzy. My meat odyssey began with the Pig Wings (P440 for 5 pcs). 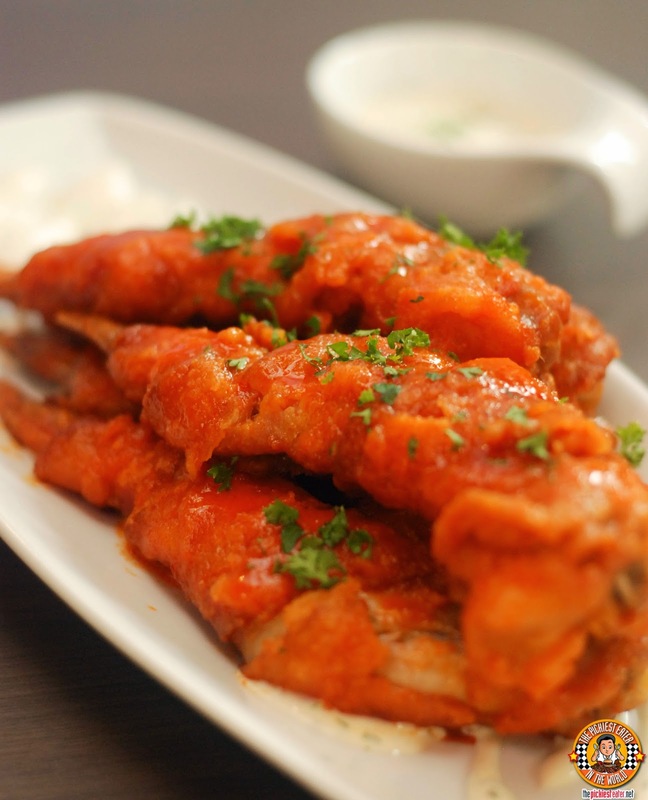 Livestock managed to find a way to give the popular appetizer "Buffalo Wings" a nice porky twist by wrapping it in BACON before frying and dipping into the zesty Buffalo sauce. A creative fusion of two classics from Pinoy and Italian cuisines, the Adobo and Kesong Puti Pizza (P395) was a delightful play of flavors. 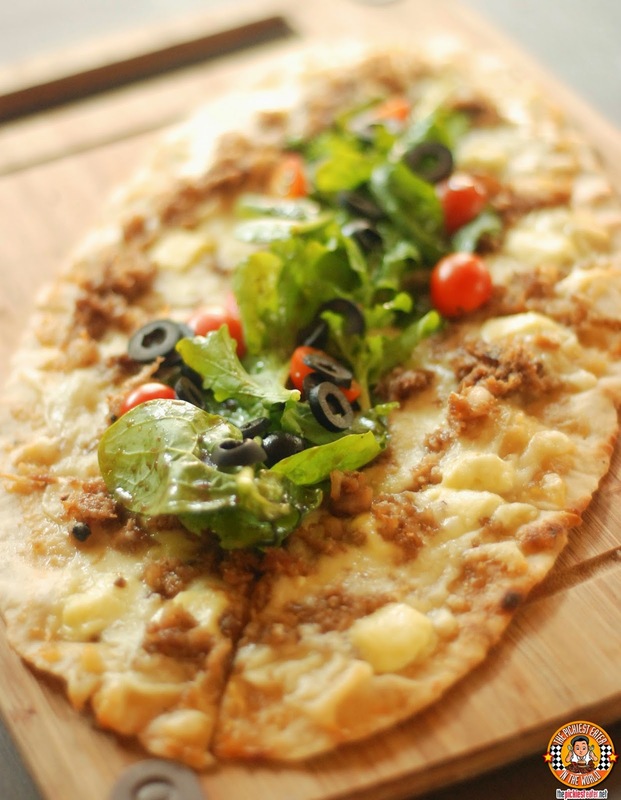 The pizza is topped with crumbled adobo and kesong puti, and laid out on a thin, crispy, pie crust, covered with garlic puree and creamy mozzarella cheese. They then brought out a pasta dish in the form of the Pork Cheek Ragu (P375). This was a plate of al dente Tagliatelle pasta, mixed in topped with slowly braised pork cheeks over tagliatelle in a flavor packed red wine sauce. The pork cheek had a nice bacon feel to it, making it extra awesome hehe. Then we finally got to the main event, and folks, this was a double header. The Livestock Crackling Pork Belly (P290 for 300g / P490 for 500g, P895 for 1 kilo) is one of those dishes that you will have dreams about for days on end. 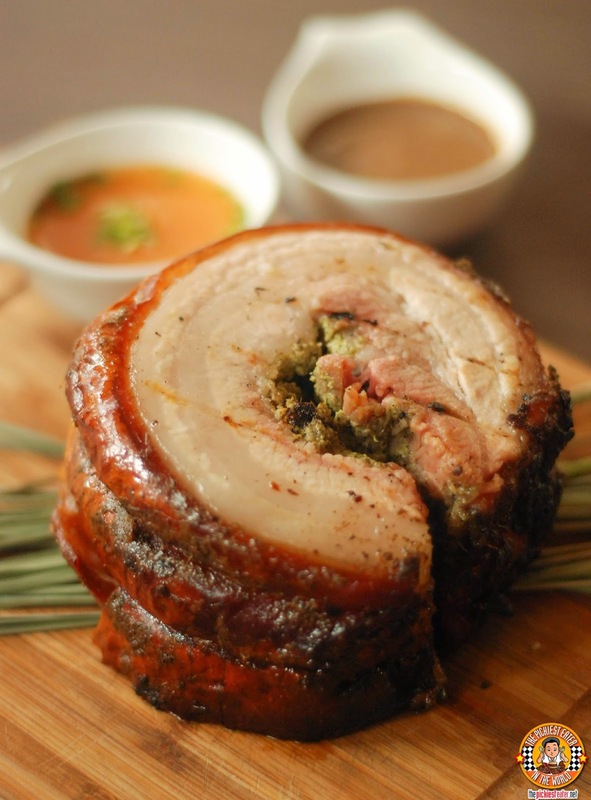 Imagine a succulent pork belly roll, stuffed with fresh herbs and roasted until the skin is to a crisp. 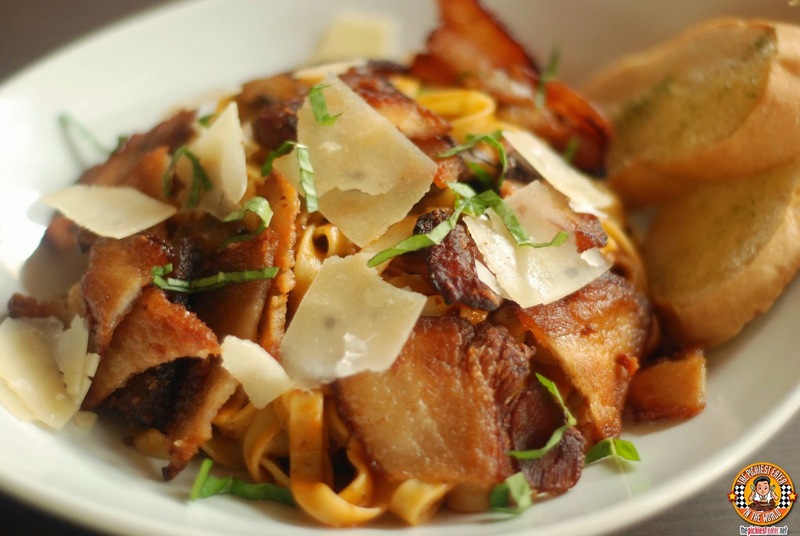 It's a no-brainer that I love fatty pork, and this fit the bill. The herbs gave the natural flavor of the pork a burst of innate fragrance that tantalized my taste buds. My only warning to you, beloved readers, is that be prepared, because it does have high fat content, and it is on the oily side, If you're like me and that sort of thing doesn't bother you, then you're good to go. No one believes me when I say that I'm not the biggest fan of Crispy Pata. Why? Mainly because, as much as I enjoy the crispiness of the skin, more often than not, I find the pork meat gets too dry when deep fried. This is absolutely not the case with Livestock's Melts-in-your-mouth Crispy Pata (P590). 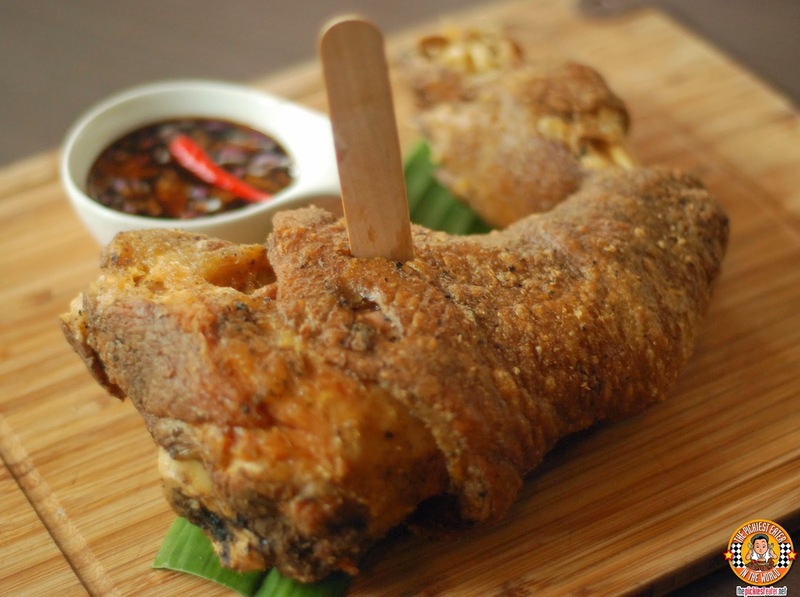 This Crispy Pata is actually what put Livestock on the map, because it is so tender, you can actually slice it up with a popsicle stick, without compromising the juiciness of the meat! Don't believe me? Watch this video! Pretty phenomenal, huh? And the awesome part about it, is that it tastes great too! 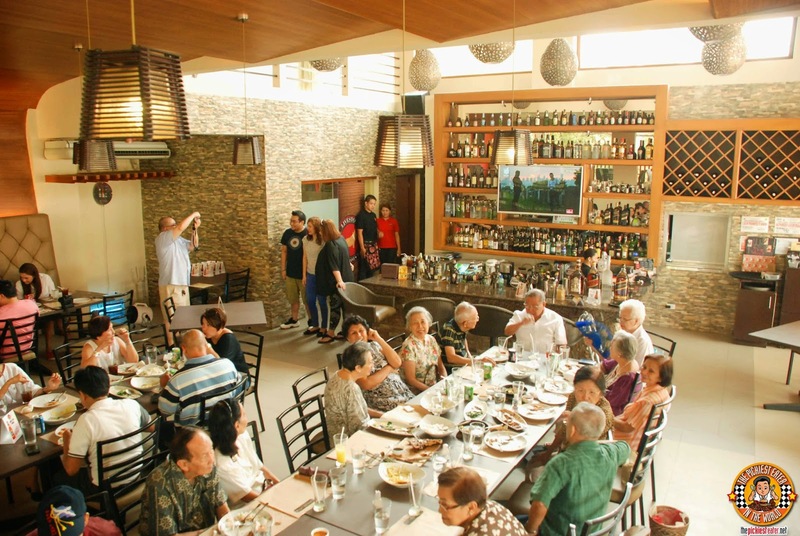 Best Crispy Pata in the Philippines? Well that's a bold claim, but it's hard to argue against it! 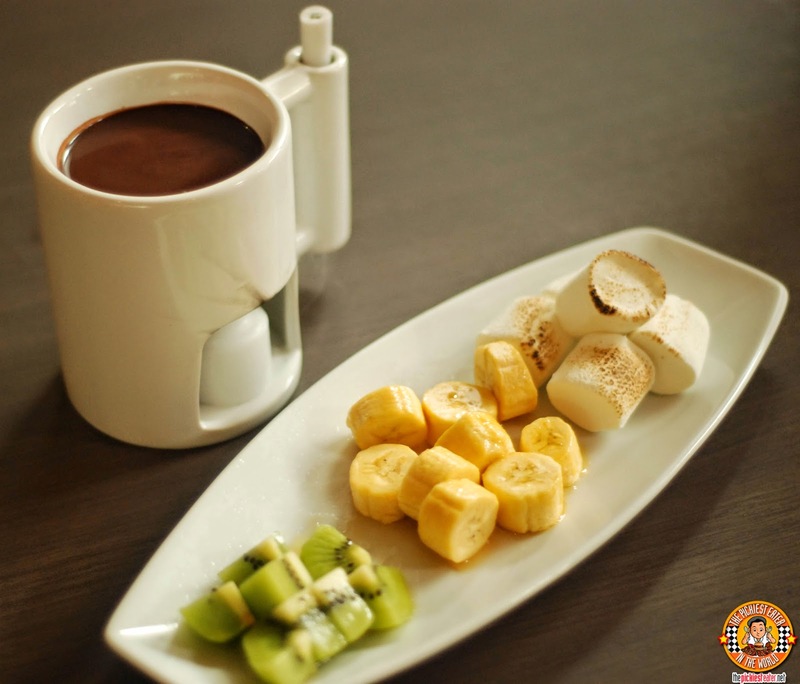 We wound down the meal with some sweets, starting with the Salted Chocolate Fondue (P420). Slices of fresh Kiwi, Banana and Marshmallows on a platter, ready for dipping into a cup of hot melted dark chocolate seasoned with a bit of brandy and sea salt. But for me, it was the Bacon Ice Cream Sandwich (P180) that served as the perfect ending to an epic meal. 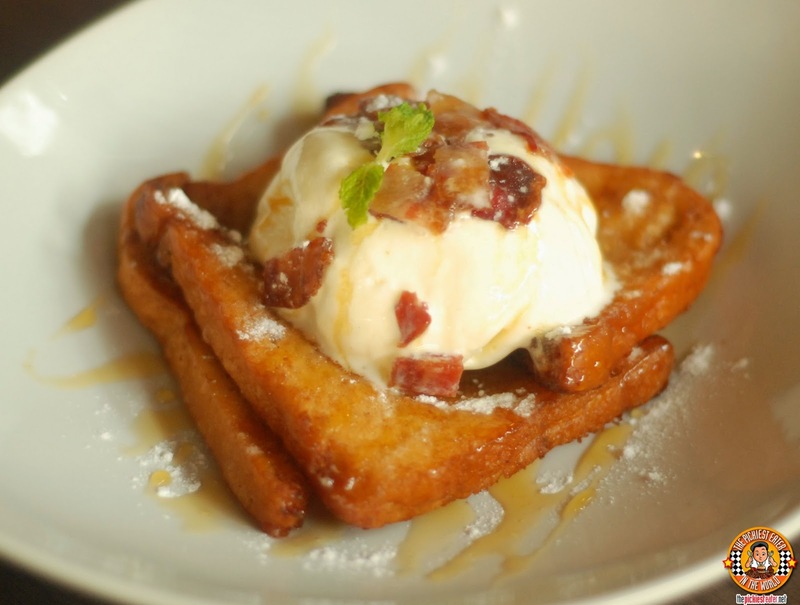 Golden slices of French toast, topped with a scoop of Vanilla Ice Cream, drizzled with syrup and caramelized bacon bits. Finally.. On the top of the Evolution chart! Livestock's dishes are just along the lines of my palate, so i'm sure it would surprise no one to hear that my goal is to try every single pork dish on their menu. I'm not even halfway there, but I can assure you, I will get it done sooner or later! The difficult part would be not succumbing to the temptation of ordering the same dishes over and over again hehe..
You haven't seen the last of me, Livestock! I shall return!! hahahahahahahahahahahahahaha!!!!! i was sooooo waiting for that PICTURE!!!!!!!!!!! awesome!!!! welcome back !!!!! CHAIRMAN WANG'S: HAND PULLED NOODLES IN MOLITO! YABU'S MENCHI KATSU WITH BABE FOR FOOD!